You've dreamed, planned, prepared, spent the money, packed, traveled, spent more money... But will the big moment arrive finding you unprepared to take advantage of it after all that? It happens to the best of us. Believe me! Elk are like ghosts sometimes. Showing up when you are sure there are no elk anywhere around. Elk are like tractors other times, giving you seconds of noisy warning they are coming right to you! Not being prepared and not aggressively reacting in time for that moment of truth can cause your one good opportunity to vanish, just as suddenly as it appears! I have been successful at killing elk each year for quite a string of years. I always hope that string won't get broken! I hunt hard and I hunt a lot. I am relentless! That has a lot to do with the success. I am also willing to kill a cow or a rag horn. I put effort into getting way back each day on public access areas and I am willing to de-bone and pack an elk out on my back, if necessary. I hunt alone, because I hunt hard and often go to work in the afternoons. I don't get to hunt all day hunts most of the time. Hunting alone means you can't get behind yourself and call. I am constantly moving away from my calling position, when I can. It's a greater challenge when you hunt alone. It takes aggressive relentlessness. Regardless of how you hunt, it's EASY to miss the opportunity that you worked so hard for. I can tell you countless stories about lessons I've learned, forgotten and relearned! For instance, if you hear a bull coming, don't just focus on where he is. There may well be cows coming in ahead of him! They will bust you, if you aren't ready and you'll never see the bull. Between bugles I could hear squirrels announcing the elk as they came by, giving me a travel line. I lined up for an ambush in very close jack stand pines. I was SO ready for that bull! I could see his horns above the short trees moving toward me. I had a few seconds before I needed to draw my bow. Then, to my shock, a cow almost ran into me. I accidentally touched my release and the arrow fell on the ground as I jumped out of the way. Opportunity: Vanished! Remember, cows often precede bulls, but you often only see horns, or hear the bull. (Archery tip: Keep your finger behind the trigger until you're ready to release an arrow!) You'll hear me say that at our shop often. Missing the opportunity can happen with a bow or a rifle. I was stalking elk by following tracks in the snow with my son when he was young. When a cow finally stood broadside at 50 yards I whispered, "shoot!" He responded, "I can't. I just scooped my rifle barrel full of snow." She bolted by the end of the sentence. He made the right call. Opportunity: Vanished! He eventually put it together on an elk, though. My first elk kill back in the 80s went like this. After watching bedded elk way up high all day, they finally started moving down before sunset after a quick, terrible storm. I crawled on my belly, hands and knees to get to a little rise where I could get a shot. When I finally squeezed the trigger from a prone position- click! I very slowly bolted the misfired round onto the snow and carefully closed the bolt on another one. I was only 75 yards away and the noise was making them nervous. Squeeze- click! This scenario repeated itself until all my 30.06 rounds were lying in the snow and the elk were all staring up toward me. I dried one of the rounds off the best I could, prayed and reloaded. Boom! My first elk was down. That could have resulted in a vanished opportunity. All because the excessive grease in my rifle had frozen up in the very cold weather. I could tell you of so many vanished opportunities through the years, but let's fast forward. I have learned to react instantly, even if drawing my bow might spook an elk. If your bow isn't drawn, your rifle isn't up, you can't shoot anyway! Don't wait for a better opportunity. Draw your bow or aim your rifle. If you're cross hairs or sight pin isn't on an elk, you might miss an opportunity. I'm not saying take unethical, thoughtless shots. Just get ready first, then decide. These days I draw my bow much more often than I used to. I also let down a lot. This year, I sneaked slowly forward in some thick brush trying to find a window between myself and a nearby cow. I drew and studied the only window I could get, then let down. Know you're limitations, but don't limit your options by not taking aim when you can. It's good practice, regardless. Consider the current opportunity the only one you will get! It just might be. A friend of mine killed a cow elk this year on opening morning. He said, "I've learned never to turn down something the first day of the season (or hunt) that you would be glad to kill on the last day." He's right. Those of us who are successful at killing elk yearly, aren't trophy hunters. And, we can't spend thousands of dollars on several trips all over elk country. Be ready for that one opportunity. Another thing I have learned the hard way through the years is this. With my current skill set and hunting areas, I will get at least one good opportunity to kill one with a bow. Usually a bull of some kind will be standing in front of me, eventually. (Unless I kill a cow first.) I have learned that I need to aggressively react when that potential opportunity arrives. A few weeks ago I had a herd bull walking across in front of me. It was perfect. I saw where he was going to be, so I quickly ranged the distance to a tree he would soon pass by. "50 yards". I drew when his eyes went behind some trees. When he reached the tree I had ranged, I stopped him with a grunt. I put my 50 yard pin on him and released an arrow well over his back. Opportunity: Vanished! I checked the distance again to the tree. "35 yards". In my haste, I had not carefully made sure the laser bounced off the tree, not something behind it. I should have pushed the range finder button several times, but I only had seconds and I still needed to draw at the right moment. Putting everything together is something we can practice in our minds. See many scenarios in your mind. "See it before it happens", so you can act quickly when it does. I'm not through yet, though. Rifle season is here! Speaking of rifles, I have had opportunities vanish because my rifle was slung over my back. Many years ago I stopped doing that for good when I started using a ready-carry rifle sling, like the Safari Sling . I never have to fumble with my ready-carry bow sling, either, like the String Sling . Take out the bad habits and equipment that can cost you a lost opportunity. Take as many "opportunity vanishers" out of the picture as possible. Never call elk without an arrow nocked, or gun at the ready. 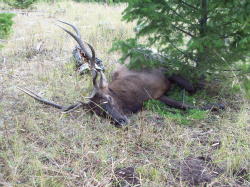 Ask anyone who has hunted elk much what eventually happens when you do that! And, set up the scenario! Don't just stand there, unless it's still dark and you're just trying to locate elk before daylight. Two years ago, I decided to stop and eat lunch at a nice little spring around noon. I sat down on a log and got lunch ready. I gave a little cow chirp and stuffed something in my mouth. Within seconds I heard a crunch behind me. I turned and was face to face with an elk 20 yards away. An opportunity I never expected- Vanished! Several years ago, I sent a cow call across a fence to a herd bull that was screaming. In the time it took me to nock an arrow and look up, the bull was heading straight for me. 20 yards away. He walked up to my kneeling position and breathed steam on me from his nostrils. He turned quickly and walked straight back to the fence. I hate to admit it, but that kind of scenario has happened many times to me. If you call, be ready. 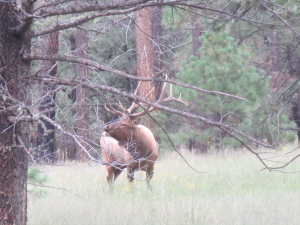 If an elk is coming, expect an opportunity and be decisively ready. The following year I was determined to be ready when the opportunity arrived. Very early one morning I heard a bull doing a locator call while walking across in front of me in the dark. I had to wait some agonizing minutes to call during first light. When I did, he immediately headed my way. I told myself, "I am NOT going to blow this opportunity!" On my knees I drew my bow before he came into view and held it (something I practice at length). The bull walked straight toward me and to my left a bit. When he was five yards to my left, he stopped and I released. I was focused on doing it right and it paid off. Earlier this season I was stalking out ahead of a cow-pushing bugling bull. I could tell by his "round-up" bugling that he had cows that he was moving. He was pushing them right down a heavy trail. I stalked in and almost bumped his cows out ahead of him. I slowly backed out and did a clover leaf out ahead of them again. I was sneaking rather than running. I was not aggressive enough. I got 70 yards away from where they were walking, just in time to watch that huge herd bull and his cows walk by. It was too far for me in that scenario. Opportunity- Vanished! Being aggressive means taking risks that you might spook an elk. You just might get away with it. Sometimes you might have to run, if you can, to make it happen! We learn aggressive hunting through experience. OK, so I blew TWO opportunities with a bow this year. I plan to hunt aggressively with a rifle now. I learned lessons that I am determined not to repeat in the future. That's elk hunting! It's the most frustrating fun ever, right? Always be prepared and don't be afraid to be aggressive within reason! Don't do "nothing", in order not to scare off an elk, or wait for the perfect opportunity. Expect an opportunity, then react appropriately and decisively. (You can always change your mind.) Otherwise, Opportunity- Vanished! Have a great big game rifle season! 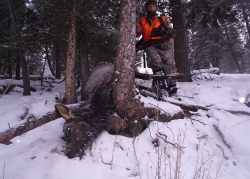 We now have a Federal Firearms License for Elk Tips Outdoor Gear, LLC in Deer Lodge, Montana. Our local retail store has only been open there since early July. So, we're still not fully stocked. However, we can special order anything related to big game hunting and outdoor gear. We'd love to be part of your hunt planning and success. 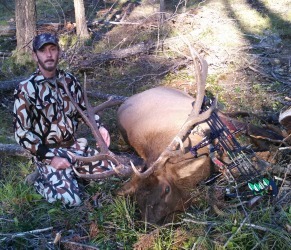 Elk Tips Outdoor Gear is our online store. Though, you can still order featured products throughout ElkHuntingTips.Net via PayPal, as has been available for many years. Special orders get special attention around here so feel free to call me (Dave) at 406-431-0876, or send us a message if you're looking for something. We'll work to get it to you at a competitive price.